Hacking is about implementing knowledge into real conditions or situation, there are no one specific hacking method aim to attack the same target with different situation, doesn’t it?. By learning hacking we also learn how to handle one thing based on several conditions, it enforce us to make any alternative ways, which is should be more efficient and helpful. 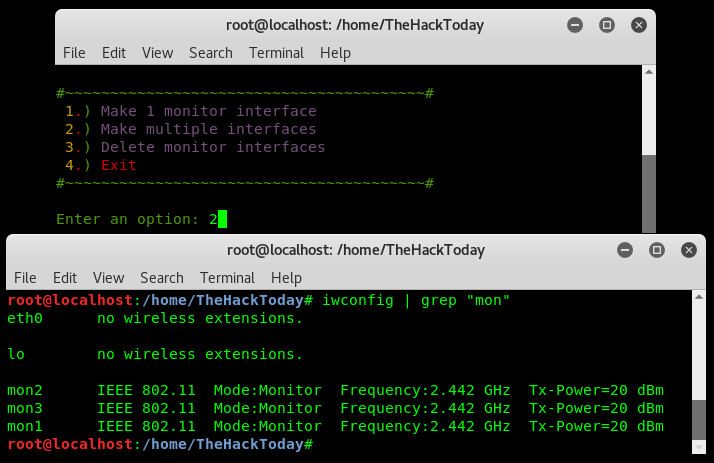 In this post you will learn detailed steps on how to create multiple monitor-mode up to 10, on one wireless interface with also different name and MAC address of each. As you need to be aware of this is that monitor mode and promiscuous mode are different. Monitor mode only worked for wireless network interfaces, it allows to monitor all traffic received from wireless network. Monitor mode also allows to capture packets without being connected on any access point or a network. Unlike promiscuous mode, which is could be applied on both wired and wireless networks, also allows to sniff packet in malicious way that take place on connected networks. When you conducted wireless attacks on large target, you might need several monitor mode, with some reasons and purposes, whether just to identify certain monitor mode handles specific target or to make multiple attacks by that. You may notice the uselessness if you are attacking small target. If you are wondering how to create multiple monitor mode on your Kali Linux, just follow my words. First of first, you need the additional tool, this tool created by Yokai Seishinkage, called MAKEMON. Thanks for your great contribution dude. See his makemon works on Github. 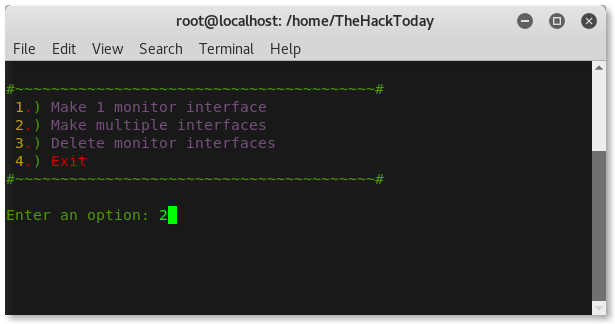 Now, open terminal and enter these concatenate commands, and make sure you are on root user. What those commands did are, firstly you grab the tool (makemon bash script command) from github by cloning his project, then move the downloaded makemon files into /usr/bin/ so we could call it directly into terminal. Then set to root environment and allow permission to be ran. Ok, i assume you already installed makemon. Now, run makemon directly type on terminal “makemon”. First time run, you need to set your wireless interface preferably. Then, you will be bring into main menu. it has 4 options, our aim is to create multiple monitor mode so choose option 2.) Make multiple interfaces. Then, makemon will asks how many new virtual NIC do you want, it is up to 10 new VNICs. See, i have 3 additional wireless interfaces as displayed right there. Now, i could do multiple attack or mass attack on large target. To delete those monitor interfaces run makemon again and choose option 3.) Delete monitor interfaces. Until it says “all mons is gone“. Makemon has a limited capability to make a clean reset, you need to restart your network manager to make your networking works well. And it also has limited ability to remember the chosen wireless network interfaces, when i set my external wireless interface on Wlan1 as the preferable interface to set, then i re-plug my external wireless interface, it set my internal wireless interface instead of my external.